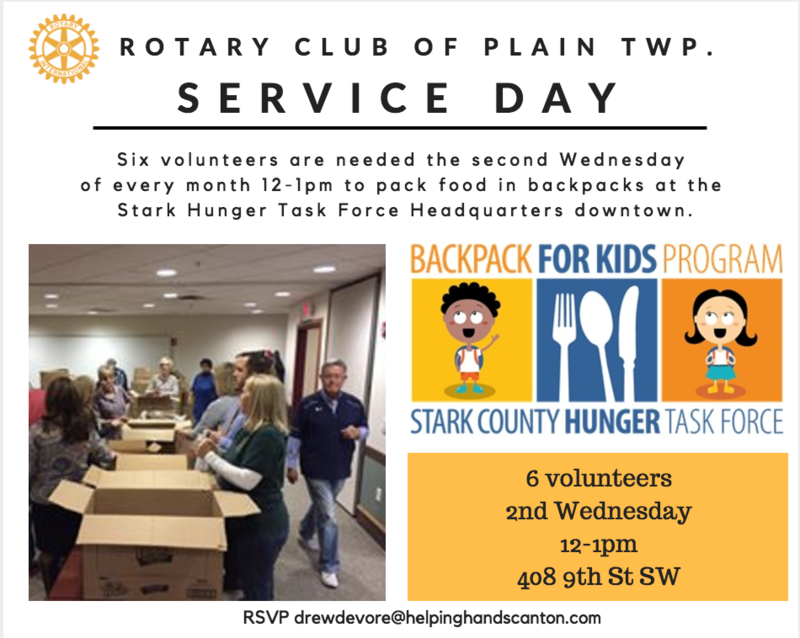 On the second Wednesday of every month, Plain Rotarians will pack backpacks for children in need at the Stark County Hunger Task Force headquarters in downtown Canton. Designed specifically to target childhood hunger, every month the Backpack for Kids Program supplies crucial weekend meals to over 2,200 school-aged children at five local elementary schools in three Stark County school districts. Students at risk of weekend hunger receive a bag of food from which they can easily assemble four healthy, non-perishable, and kid-friendly meals to sustain them over the weekend. Students are identified by their participation in the National School Lunch Program (NSLP), through which they receive free and reduced lunches during the school week (Monday through Friday).